First, your moment of Nerd. Did you know (according to Wikipedia) that asparagus was not cultivated in the US until 1850? That is amazing, since it was popular in Europe for 400 years earlier and was enjoyed as long as 3000 years ago in Egypt. But the most important thing to know about it is: Don’t buy it canned and don’t buy it frozen. Both are guaranteed to be disasters. You can only buy it fresh. And it doesn’t take much cooking to bring asparagus to a perfectly crisp-tender state of bright green perfection. This recipe, adapted from The Complete Vegetarian Cookbook by America’s Test Kitchen (currently for sale at Costco and worth every penny) will explain how to cook asparagus perfectly, even in your tiny house on wheels, assuming you have a stovetop to boil water and a slotted spoon. 1/2 cup chopped, fresh basil — by the way start growing this in a pot like a houseplant from those basil plant plugs in plastic cones sold in grocery stores. Just put it in more soil and a bigger pot. Put outside in the sun or a bright window daily. Bring a medium pot of salted water to a boil. As it is coming to a boil, fill a large bowl with ice water — if you don’t have ice cubes, just use the coldest water you can find. Set aside. When water is boiling drop in asparagus and time it for precisely 2 minutes. Using a slotted spoon, test a piece at exactly 2 minutes by removing it from the pot and dropping into the ice water. If it’s still a little woody, drop it back into the pot for another 30 seconds. If it’s al dente crisp but tender, it’s done. Use slotted spoon to quickly remove all the asparagus to the ice water bath. This stops the cooking process immediately. You don’t want to overcook asparagus. Keep the pot of water boiling now and add the pasta. Cook until noodles are al dente, or till desired tenderness. Remove the now-cooled asparagus from the ice water and put into a large salad bowl. Use the slotted spoon to quickly remove the pasta and put it into the ice water bath (by now lukewarm water is good enough). Once the pasta has cooled, drain the water and put that vitamin and mineral-rich water on the plant outside your door! Add the pasta to the bowl with the asparagus. Add the halved cherry tomatoes to the bowl. If you haven’t toasted the pine nuts or grated the cheese, do that now. Also, chop the basil. Set all 3 aside. Whisk together the lemon juice, shallot and garlic, salt and pepper. Drizzle in the oil as you are whisking until it reaches a nice consistency. 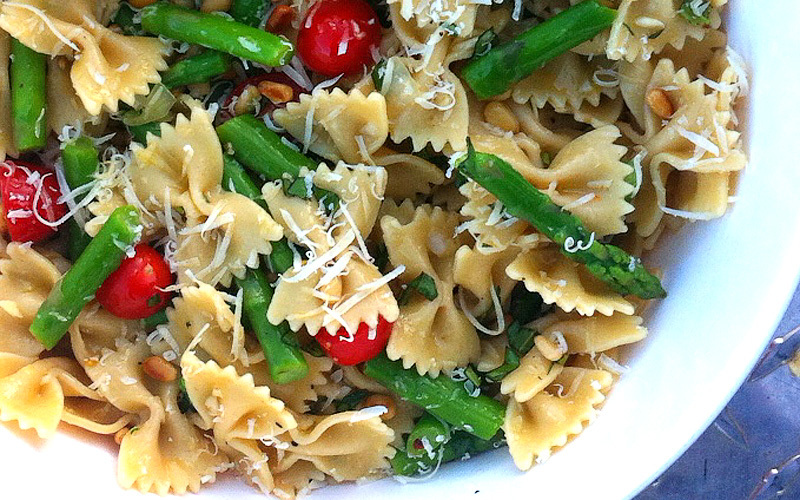 Toss with the pasta-asparagus-tomato mixture and let sit for a few minutes so the noodles absorb the flavors. Mix in the basil, cheese, and pine nuts. Add more salt and pepper to taste and serve. Looks a simple and healthy to make supper. Can’t wait! Asparagus will be in season around April, I guess, here in England when our local farms & market gardens often sell bunches at the roadside. Hi Cousin! Yes, it’s always in grocery stores even though technically it’s not in season till then. Why is cooking frozen asparagus a disaster? This is a great question! Perhaps you have had luck with it, Dawn, but I’ve had none. Canned and frozen asparagus cannot approach the quality or taste of fresh spears because the processes ruin the texture. Perhaps if you’re going to bury the spears in a quiche or puree them for soup it might work IMHO. What’s your experience with this? if it’s got asparagus, I’M IN ! ! ! !